Comfrey is an amazing herb. This comfrey salve is a must have for your home herbal apothecary. Comfrey is known to have anti-inflammatory, analgesic and decongestant properties. It is also known as one of the herbs to heal broken bones. I like to have this salve to use on bumps and bruises. 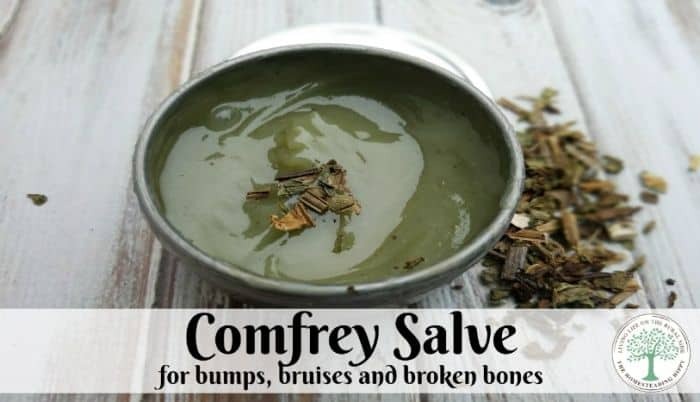 Comfrey root salve has been shown to be a bone knit herbal remedy. Comfrey bone healing research shows it helps reduce the time in healing. With kids in taekwondo, and a busy homestead, broken bones, bumps and bruises happen on a regular basis around here. I usually make a batch of this every three months or so to keep up with demand. You only need some dried comfrey, which you can find at my affiliate partner, and some carrier oil. I used fractionated coconut oil (find it here), but you can use almond, jojoba, hemp seed, or even olive oil for this. Do you have bees? See how to render beeswax for yourself here! Place dried comfrey into a clean glass jar. You can use a canning jar or any other glass container you have. A glass jar is the best choice due to the heat and the oils. Cover the herbs with the oil. In a heavy-bottomed pot, add enough water to come up on the sides of the jar. You want the water to be at the same level as the oil in the jar. Do not allow the water to get into the jar. Heat the water to a simmer, then turn the heat down. You will want the water to be at a “just simmering” level, not boiling. Using a towel or trivet, place the jar of herbs and oils into the water. Cover the jar loosely with a lid to keep the herb’s oils in place. Keep in the simmering water for 45 minutes. Don’t allow the oil to get too hot. I use a thermometer to make sure it stays under 100°. If necessary, turn the heat down lower. Allow it to cool completely. For a double infused oil, drain the oil from the herbs. Since the herbs were in oil, they are not good to add to your compost. The oil may not break down. Toss the used herbs in the garbage instead. Weigh out new herbs. Add the new herbs to the infused oil. Place back in simmering water for another 45 minutes. Double infused oil would be most often used for helping broken bones heal. Drain the herbs from the oil using strainer or cheesecloth. Carefully press down on the herbs to ensure all the goodness is infused into the oil. Put the infused oil back into the barely simmering water and add the beeswax. Allow to slowly melt together. Remove from heat and allow to cool completely before use. Label and store in a cool, dry place. Use within six months. You want to allow the herbs to dry to remove as much water as possible. The water may cause mold or quicker spoilage of your comfrey herb salve. Crush or mash about two tablespoons of fresh or dried comfrey leaves in very hot water. Place the mashed ball of hot leaves inside a piece of cheesecloth or a sturdy paper towel and tie the ends together with a rubber band to make a little packet. Place it against the wound. Use about a quarter sized amount each time. You can apply this 3-4 times a day to help promote healing. Obviously, you can’t remove anything covered by a cast, but you can gently rub under the cast as best as possible. You DO NOT want to use comfrey salve on open skin, it may cause irritation. This comfrey salve is only for surface wounds that are closed like bruises, sprains, and broken bones. How will you use this comfrey salve? Be sure to pin this for later! Does it matter if you use dry or fresh comfrey? my experience is that dry is better to work with as a salve, and fresh is better to use as a topical application directly as a compress. You really need the root of the plant to get the best benefits for this ,and using fresh may mean you don’t get that. You make this look so easy! I love the beautiful green color. It just looks healthy and healing! I have a comfrey bush. Do I use the leaves?, Flowers? Which part? typically you would use the root. Is it worth my time to dry comfrey leaves for the salve? Also, how much of the roots can I dig up, without loosing the whole plant for next year? yes, they need to be dried. the water in the plant can cause the salve to mold quickly otherwise. I have a jar of comfrey in olive oil that has been sitting for a month. I was afraid I would get it too hot using this method so I am cold infusing it. Any information on it’s effectiveness for bone and marrow cancer? I plan to make some for my sisters arm…as common for this cancer her arm broke due to lack of marrow, the surgeon packed it with cadaver bone to speed the recovery of her marrow. Will the comfrey help speed up her recovery too? Also, what about the incision area? Is the salve safe around wounds? Is this 100 degrees Celsius or Fahrenheit? In your article you say to use leaves, but in the comments, you said to use the roots. I would love to make this, but am confused as to whether to use leaves or roots. I have a bottle of Comfrey Oil I purchased as I don’t have access to the plant. How many drops of the oil should be used as a replacement to the actual herb? If you find any gardening forum and ask in the spring if someone wants their comfrey divided, you will find yourself with an abundance. It is an aggressive grower and quickly overfills its allotted space. People will be happy to have you take some off their hands. Just 2 grams of the root in a cup of oil (200 ml)??? Can you mix different oils together to make one cup? Also, does it have to be comfrey leaves or root? Either?